Apologia Educational Ministries is very well known for their Science curriculum in the homeschool community but they also offer many other products including: Biblical worldview studies, homeschool planners, online classes, and books for homeschooling parents. I had been looking at their Science curriculum for a while now after learning more about them at a Twitter party and was very excited to see that the first TOS Crew Review of this year was going to be just that! We received Exploring Creation with Zoology 1: Flying Creatures of the Fifth Day to review. This book is part of their Young Explorers series that combines reading, activities, and notebooking. Our package included the Textbook and the Junior Notebooking Journal, which was made specifically for kids in grades K-2. (They also offer a Notebooking Journal for upper elementary school students.) 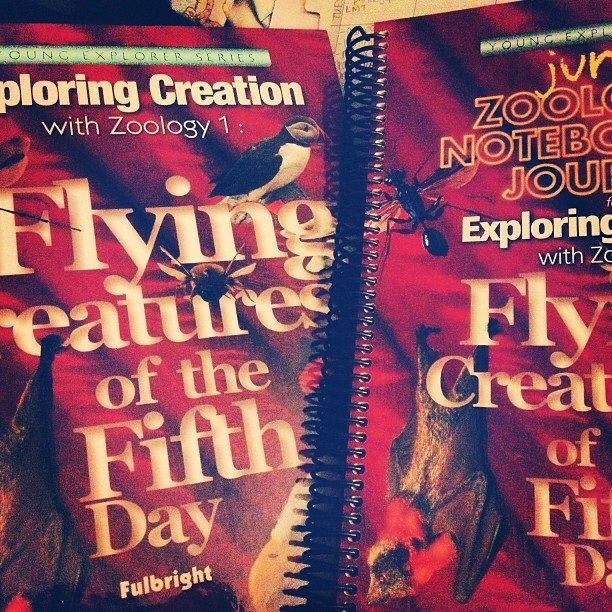 Other books in the Exploring Creation series are Zoology 2: Swimming Creatures of the Fifth Day, Zoology 3: Land Animals of the Sixth Day, Astronomy, Botany, and Human Anatomy & Physiology. We have been following the schedule listed in the notebook and doing Science two days a week. This comes in pretty handy and I think I'll continue to do it that way because I can plan it out pretty quickly and we're not overwhelmed doing Science every day in addition to all our other subjects. By following that schedule, we've been doing one lesson every two weeks. 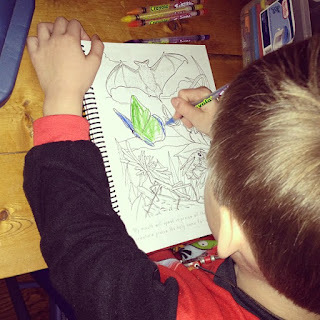 In the Flying Creatures textbook, we have been learning about all different types of flying creatures from bugs to bats to birds, and the different things that make them unique - their homes or nests, what they look like, their flying patterns, their family structure, etc. Some of the text has been a little above my seven year old's head so I have just tried to pick and choose what all we read - I'm not reading it word for word, and some of the subjects we've just touched on a little, like the classification of animals for example. It had a lot of Latin words and I could just tell the more I read, the more lost he got. So we skipped ahead a bit and moved on to the next section and all was well. (We'll come back and revisit that section later.) The "Try This!" section of each chapter is good too if you have a busy little guy (like me) to take a break between the reading & do an activity. I've also been looking ahead and what we'll be studying the next week so I can find applicable books at the library that go along with that chapter's subject. My son really loves the Junior Notebooking Journal. As I mentioned above, it's made specifically for kids in K-2, or who are beginning or struggling writers. Each lesson starts out with two big coloring pages for him to color while I read aloud to him from the text. (This is very helpful to keep him listening.) The next few pages have pre-made templates for him to fill in with his own thoughts & ideas - he can draw a picture of his favorite animal in that lesson or jot down a few different thoughts about what he learned. After that, there are different activity pages for him to do - matching vocabulary words puzzles, mini books, crossword puzzles, project record keeping sheets, and more. Lastly, there are copywork pages - one of my favorite things from the Notebook! Print and cursive are both included and they use short Scripture verses that the child copies down. Although you wouldn't *have* to get the notebook, I would highly recommend it as it was a wonderful complement to the text and integrated so many different activities that my son is really enjoying. I think this curriculum could also easily be worked into most homeschool budgets as the textbook retails for $39 and the notebooking journal for $24 - well worth it in my opinion! I'm looking forward to continuing the rest of the series. Thanks so much for your review! I am so glad your son loves the journal! Yay!